For novel ideas about building embedded systems (both hardware and firmware), join the 28,000+ engineers who subscribe to The Embedded Muse, a free biweekly newsletter. The Muse has no hype and no vendor PR. Click here to subscribe. 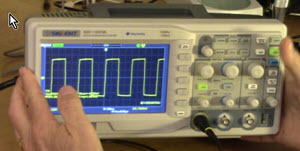 This month we're giving away a slightly-used Siglent SDS1102CML two-channel, 100 MHz bench scope which I reviewed here. Only Embedded Muse subscribers are eligible. Enter the contest here. In the olden days we had scopes. Then digital scopes redefined the landscape, instantly obsolescing entire classes of storage tubes and scope cameras. In the 90s the mixed-signal scope unified both the oscilloscope and the logic analyzer, crucially adding cross-triggering so one could see how analog and digital events interacted in time. Tektronix has just taken the next logical step, though the idea had never occurred to me. Their new MDO4000 series of scopes marries an MSO to a spectrum analyzer (SA). (MDO is a new TLA for Mixed Domain Oscilloscope.) Keeping true to the spirit of the MSO, the MDO can trigger off analog, digital or RF inputs. The company tells me that at least 60% of engineers who use a scope also use an SA. Really? That number seems huge. SAs have historically belonged to the domain of the RF engineer. But Tek says since 2006 the rise of wireless has changed all of this. 60% is still a bit much for me to swallow, so for those of you who have never used a spectrum analyzer, the SA is much like a scope, except it displays amplitude vs frequency, instead of amplitude vs time. The units have lots of associated features, of course, but their essence is working in the frequency domain. They kindly sent me a loaner MDO4104-6, which has four 1 GHz analog channels, 16 digital, a 5 GS/s sample rate and 6 GHz RF input. (Analog channels 3 and 4 are 2.5 GS/s). For some applications combining a SA and scope makes a ton of sense. Working on a frequency-hopping radio you could see the digital signals that initiate a hop, the associated analog, and the resulting RF to discover when the signal stabilizes, or if it overshoots, etc. Or you could watch the behavior of a PLL as it establishes a lock, which I did. Watching the PLL in the frequency domain was really enlightening. Each of the scope's three sections (analog, RF and digital) can be individually enabled. If only RF is on the entire screen becomes a full-featured spectrum analyzer. And what a screen it is, 10.4 inch TFT crispness and color. Or just enable the analog to use this as a conventional oscilloscope. If the RF is on as well as analog and/or digital channels, the latter are on the top half of the display, and the spectrum on the bottom. A lot of scopes today have a built-in FFT math function, which rotates the time domain into the frequency domain. But those have significant limitations, starting with bandwidth. Cross-talk and other issues can (and do) corrupt the display. I find that these FFT functions are only crudely useful. In contrast, the MDO has an RF stage that looks like one from a real SA, with plenty of shielding and lots of gain. For instance, I connected the RF input to an antenna (a short clip lead) and tuned to the FM band. Here in Finksburg, MD we're pretty far out in the country. A single top 40s station overpowers most of the others, and, sure enough, it popped up with -67 dBm of energy (on the order of 100 microvolts into a 50 ohm load). I enjoy listening to Car Talk Saturday mornings while working with loud woodworking machines in my shop, but my Peltor Worktunes headphones can barely pull the PBS affiliate out of the interference. Turns out that station tunes in with just -104 dBm of power. This is an impressive tool with all of the quality one expects from Tektronix. With a couple of exceptions I think it's ideal for people blending RF into their embedded systems. First, the boot time is appalling. A minute and twenty seconds. That's even longer than my old 545 tube scope used to take. Second, at times it's slow. An example is: if the RF side is enabled the analog channels' vertical positioning lags control inputs by a second or so. With RF on and the unit configured to acquire 20m points, horizontal panning is sometimes jumpy and erratic - and sometimes not. A hugely important feature is that you can pan through acquired RF spectra. It takes a bit of head scratching to understand, though. Suppose you acquire a single-shot of some analog data while also sucking in signals into the RF section. You can, of course, pan through the analog, and, as on any MSO, see pre-trigger and post-trigger events. The buffer holds up to 20 million points, so you can pan pretty far away from the trigger event. But, as the MDO acquired those 20m points, it also grabbed spectrum data from the RF input. So panning through the analog waveform also pans through spectrums on the bottom display. If you're watching a PLL stabilize you might see the VCO voltage on the top, analog display, and, as you pan across that, watch how the PLL's frequency moves around on the bottom display till it finally locks in. The spectrogram display (which is not unique to this product) is to die for. If enabled, it's shown immediately above the frequency plot, and is that plot rotated towards the operator. Intensity is shown by color. So each acquisition on the frequency display is rotated into a single line, one pixel high. Successive acquisitions build up so the spectrogram's vertical axis is the history of all of the RF traces. If you're monitoring a slowly-changing input - perhaps the center frequency is changing - the spectrogram shows that change over time. Watching the FM band some extremely weak stations were so buried in the noise that I couldn't pick them out on the frequency display, but the spectrogram clearly showed dim lines at their center frequencies. Concentric pan and zoom knobs let you waltz through the captured signals with great ease. It's a great interface. Two multipurpose knobs' functions vary depending on which screen is displayed, but the visual prompts are very clear. The one exception is the tiny font used on-screen to indicate whether multifunction knob "a" or "b" is in play; my middle-aged eyes found it very difficult to distinguish the difference. The unit is packed with features which are detailed on their web site. Those include plenty of math operations, all kinds of automated measurements, bus decoding (depending on options purchased), and markers which automatically identify RF peaks. The RF bandwidth is selectable. I very much like the small keypad that you can use to enter parameters, such as center frequency. Though I didn't see this mentioned in any of the literature, Tek engineers tell me the MDO captures phase and quadrature data, which can be downloaded to a PC. An application they provide can then demodulate the captured signals. This is a truly complex piece of test equipment that's quite intuitive to operate. There are so many modes and so much capability that I was disappointed in the manual, which despite being 200 pages long, leaves a lot of questions unanswered. One of those questions is "what's with the odd proby things?" The TPP1000 probes supplied have the BNC connectors encased in plastic boxes. Instead of pushing a BNC in and twisting to secure it, one just pushes the box thingamajig onto the panel-mounted BNC. No twisting allowed or needed. To release you press a button on the box. It works fine but what is the advantage over the age-old naked BNC connector? I mentioned that the MDO is, at times, slow to respond. I also experienced some odd behavior where the unit was unresponsive to a control. Twist a knob and nothing happens; wait a few seconds and full functionality is restored. I suspect Tek will fix this in production versions. Units run a base price of $20k to $28k. Options can drive that cost up a lot. It's a lot of money. But given that Tek's RSA3303B entry-level spectrum analyzer starts at $35k, and the MSO4104B (the same scope without the RF side) runs $20k, the MDO's price seems reasonable. There's more info here: http://www.tek.com/mdo4000 .